For years, David H. England, CPA & Consulting, PLLC has been providing quality, personalized financial guidance to individuals and businesses. The Firm's expertise ranges from basic federal, state and local tax management and accounting services to more in-depth services such as financial statement preparation, and personal, business and estate financial planning. We believe in the value of relationships. We view every Client relationship like a partnership, and we truly believe that our success is a result of your success. We are committed to providing close, personal attention to our Clients. We take pride in giving you the assurance that the personal assistance you receive comes from years of advanced training, technical experience and global financial acumen. Our continual investment of time and resources in professional continuing education (often exceeding 100 hours per year), state-of-the-art technology and extensive relationships, alliances and global strategic partnerships (from Main Street to Wall Street) covering the entire Middle Tennessee Region is indicative of our commitment to excellence and to your success - one Client at a time. Our mission is to help Clients maintain financial viability in the present, while taking a proactive approach to achieve future goals. This requires open communication to reach an understanding of our Clients' needs through research and sound analysis. David H. England, CPA & Consulting, PLLC is dedicated to meeting these goals with high standards of excellence and professionalism. We have been a staple of Dickson and the Middle Tennessee business community for years, and pride ourselves on the level of esteem we have earned. Our dedication to hard work has earned the respect of the business and financial community in Middle Tennessee. We believe this to be a direct derivative of our talent and responsiveness to our Client base. 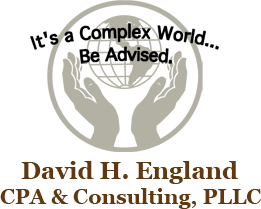 Whether you are a current or prospective Client, rest assured that individuals and businesses who choose David H. England, CPA & Consulting, PLLC receive competent and timely advice.